Have you ever felt like you were being watched or someone was standing behind you in your house, but you were home alone? Have you ever heard footsteps, but no one was there or everyone was in bed fast asleep? Does your dog bark at something persistently that’s not there, or your cat avoid a certain area in your home? Do household items mysteriously disappear from one room, and appear in another a couple days later? Do you or your children hear voices coming from seemingly nowhere, or even the closet? If you have answered yes to some of these questions, you’re not alone! Many people have experienced these phenomena, but now there’s someone you can call, at no cost, to resolve the disturbances. 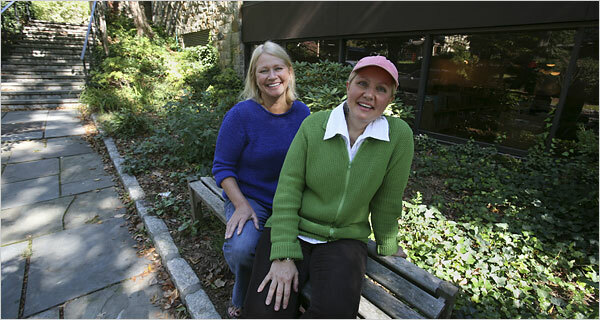 Their names are Kathy O’Donnell and Karen Darby of the Katonah Paranormal Society. The two sisters investigate occurrences thought to be caused by “the other side”. You might call them spirits, ghosts, energies, etc. and they are quite real to the two women who can sometimes hear, speak to, and see the dead. Kathy and Karen appear to be your average Bedford residents; both are blond and dress normally, nothing like the Ghostbusters jumpsuits and backpacks sported by Bill Murray and Dan Ackroyd in the ‘80’s blockbuster movie. They are just two suburban New York women, with an extraordinary gift they refer to as ‘a calling’. They share the ability to communicate with the other world and their mission, they say, is to help people, with and without bodies. Karen and Kathy have had this ability since they were children, but did not start investigating together until four years ago. They are serious about their work, and always try first to debunk possible coincidences by checking the flickering light for faulty wiring or listening to the furnace for creeks and creepy sounds, often misconstrued for spirit noises this time of year. However, the women say they can often feel hot and cold spots right away. If they think the house is occupied by someone who has passed on, they will return for a complete investigation with digital cameras and recorders. They have often captured evidence on film or tape, which is not only fascinating, but a relief for the homeowner to validate they are not going crazy. They do not reveal the names of clients for privacy reasons. They said they don’t need their gift to see that you are a skeptic. “Skepticism is fine,” Ms. O’Donnell says, “That’s our chance to educate them. They’re either open to us or not. But cynics- cynics just want to fight. I don’t want to fight.” Ms. Darby added that they have no intentions on changing people’s minds. Karen and Kathy have said that the spirits retain the same personalities they had when they were alive, usually appear fully dressed, and are ready to communicate. They have free will and will usually move on if you ask them politely. Although some are pranksters and the sisters have to put their foot down. Karen and Kathy say that spirits who have died by murder or other traumatic means, sometimes get “stuck” due to the shock of their death. They may peacefully stick around for hundreds of years until the owner of the home disrupts them with renovations. If a case is particularly difficult, Ms. Darby said they “flood the place with light and prayer, and that’s very effective.” The sisters are both Reiki masters and interfaith ministers. They are still locals, living with their families on horse farms. Ms. O’Donnell lives in Katonah and Ms. Darby lives in Fairfield, Conn. They do not charge for their service. Enjoyed this article? Check out our Mediumship section! Bio Continued: Kathy studied and received college level certification with one such teacher and author, Troy Taylor. Taylor has written extensively on the subject and Kathy credits him with providing a scientific balance to her work. Kathy is also certified as a Hypnotist, EFT(emotional freedom technique) practitioner, Silva Method graduate, Aura/Chakra Photographer, and a Dowser.